Signing in the first time takes an extra minute and requires your last invoice number or the phone number on file for your account. We will not share your personal information. Once you have selected a location, press login to continue. 100 - Orlando 101 - Sanford 102 - Cocoa 103 - Ft. Pierce 104 - Gainesville 105 - Fanning Springs 106 - Palm Coast 107 - Jacksonville 108 - Putnam 109 - Ft. Myers 110 - Tallahassee 111 - Lake City 112 - Daytona Beach 113 - Crestview 114 - Sarasota 115 - Palm Beach 116 - Pensacola 117 - Pembroke Pines 118 - Panama City 119 - Pompano 120 - Ocala 121 - Clearwater 122 - Citrus County 123 - Lake County 201 - Athens 202 - Atlanta 202 - Gwinnett 203 - Atlanta West 301 - Hilton Head 303 - Charleston 401 - Birmingham 402 - Mobile 501 - Asheville 502 - Concord 503 - Charlotte South 601 - Gautier 602 - Meridian 603 - Hattiesburg 604 - New Orleans 605 - Jackson 606 - Columbus 607 - Southaven 608 - Natchez 609 - Greenwood 611 - Jonesboro 612 - Cajun Country 613 - Baton Rouge 614 - Blytheville 615 - Memphis Where do I find my location? 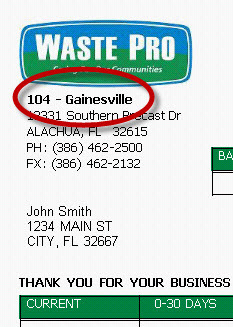 Your division number is located at the top left of any Waste Pro invoice.